ESPN Sports College Football’s Top Commentators, Deepest Broadcasting Roster to Call Unrivaled Slate of Games This Season - ESPN Press Room U.S.
College football fans will hear from the sport’s top commentators and deepest roster of broadcasters when they turn to ESPN’s networks throughout the 2018 season, with each commentator helping to document an unrivaled slate of games in the industry. The extensive slate of games begins with the regular season, continues into conference championship week, bowl season, and concludes with the New Year’s Six and the entire College Football Playoff. Chris Fowler and Kirk Herbstreit continue as the faces of ESPN’s college football game broadcast, teaming up for the fifth consecutive year on ABC’s Saturday Night Football. The two, long-time ESPN commentators have joined forces each college football season for 23 years, dating back to 1996 when Herbstreit joined College GameDay which Fowler then-hosted. Their partnership on GameDay would continue for nearly 20 years before teaming up weekly for SNF. Herbstreit continues on GameDay and has been the game analyst on SNF since the franchise began in 2006. As partners on ABC’s Saturday Night Football, the duo has helped elevate the franchise, making it the most-watched in the sport among all networks for each of the last two seasons. 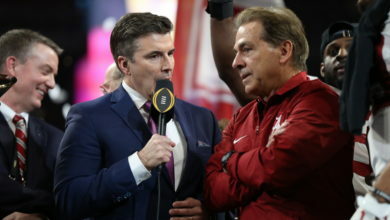 Additionally, Fowler and Herbstreit have called every College Football Playoff National Championship game in the system’s four year history in addition to a CFP Semifinal each year. Herbstreit enters this season recognized as sport television’s best analyst, having been awarded the Sports Emmy for Outstanding Event Analyst in May. Overall, Herbstreit has three Sport Emmys, winning twice for Best Studio Analyst for his work on GameDay. Maria Taylor will be the reporter on ABC’s SNF, joining Fowler and Herbstreit for the second consecutive year and continuing to be one of the network’s most-versatile commentators. In the past calendar year, the former Georgia volleyball player has become a regular reporter on GameDay, college basketball Saturday Night games, and NBA Draft coverage. She was also the host of ESPN’s Women’s Basketball coverage, including the entire NCAA Women’s Basketball Championship and appeared on a variety of ESPN’s shows and platforms, including guest-hosting Get Up! during the NBA Finals. This season, she will also host select episodes of College Football Live each week. Veteran ESPN play-by-play commentator Sean McDonough returns to the network’s college football coverage calling a marquee game each week as part of a new multi-year deal which was announced in March. McDonough, who has been with ESPN since 2000, was a top play-by-play voice on Saturday afternoon ABC college football before moving to Monday Night Football in 2016. McDonough will be a prominent college football voice throughout both the regular season and post season, including the College Football Playoff. Established analyst and former Penn State national championship-winning quarterback Todd Blackledge and multi-faceted reporter Holly Rowe welcome McDonough to their crew, as the group will regularly work the ESPN primetime game throughout the season. Heading into this season, Blackledge and Rowe have been broadcasting games together for 11 of the last 12 seasons, including calling a CFP Semifinal each of the previous four years. Rowe’s work extends well beyond the college football world, reporting on a variety of sports throughout the year including men’s and women’s basketball, gymnastics, softball, and volleyball. All four commentator groups will regularly work ESPN or ABC games on Saturdays. Jason Benetti, Kelly Stouffer and Olivia Harlan will call a share of ESPN’s Friday night telecasts in addition to working Saturday assignments. Heisman Trophy winner Andre Ware will work with Kevin Brown on ESPNU telecasts this season. Ware brings a wealth of experience to the booth, having called games for ESPN since 2003. Most recently, the College Football Hall of Famer has been an analyst on SEC Network games since the network launched in the fall of 2014. ESPN has hired Dan Orlovsky primarily as a college football commentator, working both as a game and a studio analyst. The former UConn quarterback will work with Clay Matvick and Paul Carcaterra this season on ESPN/ESPN2 games, including both Friday night and Saturday games. The former NFL veteran will also appear in studio during the season, including on college football-centric shows, SportsCenter and Get Up!, offering his opinion on both college and professional football. He is expected to contribute to ESPN Radio during football season. The Connecticut native started games at quarterback in all four years for the Huskies and still holds a number of school records including touchdown passes and passing yards. Orlovsky led the Huskies to their inaugural bowl victory following his junior season in 2003 before embarking on an 11-year career in the NFL following his senior season. Thursday Night Rotation Returns: Similar to last season, ESPN will again use guest analysts to be paired in the booth with play-by-play voice Dave Flemming and reporter Laura Rutledge for Thursday night telecasts throughout the season. Last season, among the analyst appearing on Thursday night included Herbstreit, Mike Golic, Joey Galloway, Huard, and Booger McFarland. Rutledge, who just signed a new contract, will report on the games in addition to hosting SEC Nation on SEC Network on Saturdays. SEC Network: SEC’s Saturday Night crew returns with Tom Hart, Jordan Rodgers, and Cole Cubelic. The remainder of the SEC Network crews will be announced during SEC Kickoff this week. Longhorn Network: Former Texas Longhorn Ahmad Brooks will be the analyst alongside play-by-play man Lowell Galindo to call Longhorn Network’s two games this season: vs. Tulsa (Sept. 8) and vs. Iowa State (Nov. 17). ESPNU HBCU: Tiffany Greene, a Florida A&M graduate, will call play-by-play for the majority of ESPN’s HBCU games which typically air on Thursdays on ESPNU. Greene will pair with veteran analyst Jay Walker throughout the year.